The Vedavalli Vidyalayas are two CBSE senior secondary schools founded by the Thirumalai Charity Trust about two decades ago at Walajapet and Ranipet in Tamil Nadu. The Walajapet school has a separate senior secondary wing following the State Board curriculum while the Ranipet school has an additional nursery section. The schools aim to offer a challenging and engaging learning environment for their students. In January 2015 Ms. Vidya Sampath, Deputy Director of the Vedavalli schools, was browsing through the HBCSE website when she came across the Small Science books for Classes 1 to 5 and found them extremely interesting. The school principals and teachers felt that they would be ideal for their students, hence in June 2015 the two schools introduced the Small Science books for Classes 3 to 5. For Classes 1 and 2 they decided to use the Small Science Teacher’s Book with a separate series of workbooks. The Vedavalli Vidyalayas are located at Walajapet and Ranipet in the North Arcot district of Tamilnadu. The schools have large playgrounds and also smaller spaces around the buildings, all lined by trees. The Walajapet school is situated on the Chennai-Bangalore highway; behind it, to the North of the campus is a small forested hillock. A high wall keeps most unwanted forest wildlife out of the school, while allowing in a host of interesting birds and insects. The Ranipet school is close to the old highway and is similarly surrounded by green areas on three sides. A paved path from Ranipet school to the Thirumalai Mission Hospital offers rich tree, shrub, grass, insect and other life. The school at Ranipet has an open architecture: the classrooms on all the floors have low parapet-type walls on one side, with a verandah and open spaces beyond: see photo at http://www.panoramio.com/photo/34573484. There is plenty of natural light and natural life in both schools. The children, who come from nearby semi-industrial and semi-rural areas, are at home in these natural surroundings. The possibilities for science learning are many. 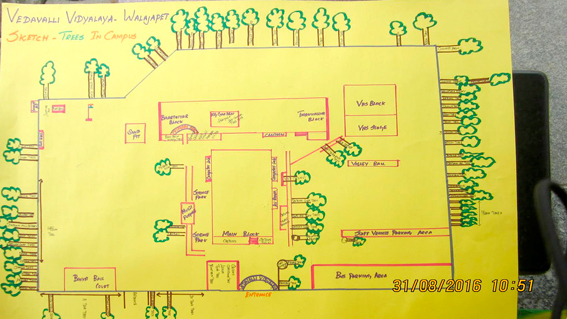 Above is a map of the school at Walajapet – hand-made by the teachers, which shows the trees on campus. This map is under construction – we would like to share it with you as it develops. A teacher from another school introduced Small Science to us. For regular use we opted for NCERT's EVS curriculum because it combines science and social studies. We use Small Science for projects for our students, and as a reference. We love these books. Small Science is like a bible for us!